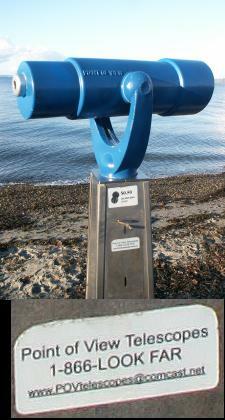 This is one of the nice telescopes you find at Alki Beach. If you notice the enlarged section below, you see that it contains one of the worst email-addresses I've ever seen: www.POVtelescopes@comcast.net. - Don't put www. in front of an email-address, or people will try to put it into their browser. - Don't capitalize any letters - otherwise people think usernames are case-sensitive. - If you are a business, get a domain.